serve and for professionalism from consultation to execution of the finished product. We use the latest technology available on the market, meaning that our clients have the largest choice of materials and designs available to them to execute their vision. From start to finish, every awning is manufactured in our 15,000-square-foot factory. This ensures the quality control and prompt service you expect. Our metal fabrication capabilities mean we handle any style or design, and our electronic heat-sealing equipment waterproofs any canvas. From vinyl-coated fabric to woven acrylics and polyester, painted, vat-dyed, or laminated fabrics, our materials are among the finest available, and our art department adds the finishing touches to your awning by hand-lettering any message or digitally printing any design that you wish. When you turn to us, you benefit from the latest graphic art computers. Have us digitize and scan your logo or create original artwork for your business. 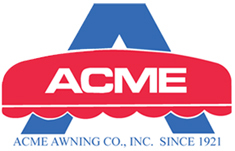 If you are an architect, designer, or engineer with questions about an awning project, call our consultants. They are experienced professionals who will make your ideas work with efficiency and expertise. Our commercial awnings turn heads. Contact us to order today, and enjoy increased business in no time. Beautifully Crafted Awnings and Canopies.